Finchley Cosmetic Clinic is looking forward to offer innovative BELKYRA®️ fat busting injections for chin fat, commonly referred as ‘’ double chin’’. The product is already FDA approved and licensed for use in the USA, where it is known as ‘KYBELLA’ and has been very great results among clients seeking to improve the double chin. The double chin is caused by excessive ‘submental fat’, or fat beneath the chin. This is a common problem with many men and women. Double chin can be seen as ageing and unflattering, especially as fat accumulation beneath the chin tends to mean that definition of the jawline is lost, leading to a ‘weak chin’ appearance. A strong jawline is associated with strength of character as well as youth. It is a feature which both women and men aspire to. BELKYRA®️ Injections will be launched in the UK this summer or autumn. BELKYRA®️ will be a prescription only product specifically to tackle double chin area. 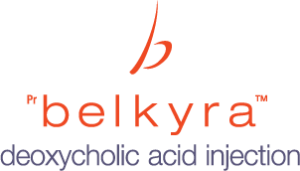 BELKYRA®️ contains a synthetic version of deoxycholic acid, a substance which occurs naturally in the body. When injected, BELKYRA®️ causes the destruction of fat cells, which are then expelled by the body’s normal metabolic processes.Once destroyed, those cells cannot store or accumulate fat again; although it is important to manage a healthy weight to avoid future build up. While this product has been in use in the USA for some time, we require approval by the authorities in the UK to offer it in this country. According to Allergan the product will be available in the early part of September of 2018. We intend to offer BELKYRA®️ at Finchley Cosmetic Clinic in London.